Titan’s Ligeia Mare. Image via NASA. 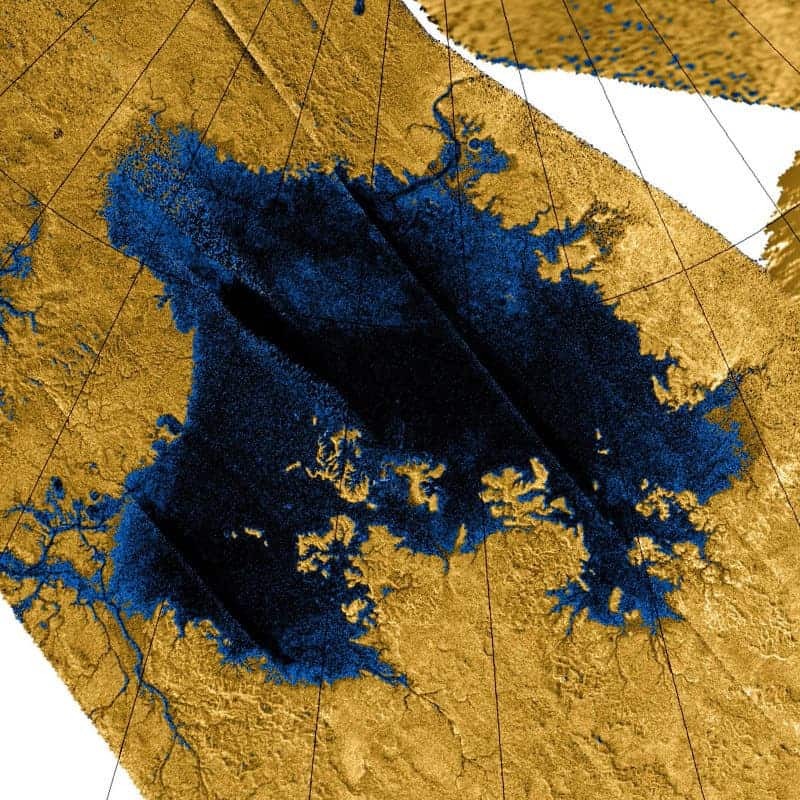 Astronomers have discovered a previously unspotted geological feature on Saturn’s moon, Titan. Pictures taken by the Cassini probe revealed a transient geological feature – a “magic island”. The bright, mysterious object was seen in Ligeia Mare, the second-largest sea on Saturn’s moon Titan. But Cassini took pictures of that area before, and the island wasn’t spotted – which can only mean that this is a transient geological feature, something which comes and goes. It’s not exactly clear what’s the cause, but astronomers have a few ideas. 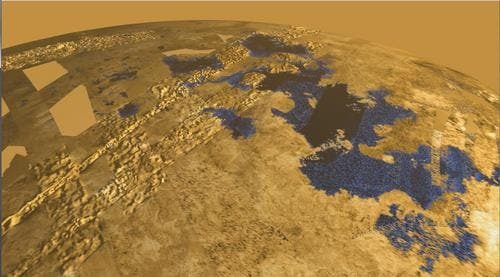 Reporting in Nature Geoscience, scientists note that this is the first time an active geological feature was observed on Titan’s surface. To discover the feature, astronomers relied on an old fashioned technique – flipping. The Cassini spacecraft sent forth a lot of data, which was received in July 2013. Hofgartner and his colleagues flipped between older Titan images and newer ones, relying on their own eyes to detect any changes. Despite being quite non-technological, this technique is often used to detect asteroids, comets and other small celestial objects. “With flipping, the human eye is pretty good at detecting change,” said Hofgartner. With previous observations, that area of the Ligeia Mare was completely devoid of any features – including waves. But in these newer pictures, they detected something else: an island, apparently popping up out of nowhere. It’s not clear exactly why it appeared, but the theory is that it showed up as a result of season changing, which on Titan takes much longer and is much stronger than on Earth. – The nothern winds are causing waves, and what they are seeing is in fact a “ghost island” – a continuum of waves. This is the simplest theory, and the least spectacular (very likely though). – Gases are pushing out from the sea floor, causing bubbles to burst towards the surface. – Ligeia Mare has suspended solids, which are neither sunken nor floating, but act like silt in a terrestrial delta. It’s not clear which one of these is happening (or if we are in fact dealing with something else, completely different). Titan is one of the most interesting places in the solar system. It’s been theoretized for quite a while that the moon harbors a liquid ocean beneath its frozen surface, and recent studies seem to back that idea up. Titan also has mountains made from ice, and it sometimes gets foggy. Along with Europa and Enceladus it is one of the likeliest places in the solar system to have alien life.